After packing the car we take the metro into town to see about lining up at 2:00 this afternoon for last minute tickets to The Last Supper. We have been unable to get tickets anywhere. We find out that these tickets, if we were lucky enough to get them, would be for after 7:00 pm tonight which doesn’t work for us. We have a three hour drive to La Spezia, which is our next destination. Too bad but “oh well.” We should have booked three months ago! I guess we will just have to try to get back to Milano some time. This is the church where the Last Supper is located. I somehow thought it would be a bigger Church. I couldn’t seem to find a spot where there were no power lines to take the photo. 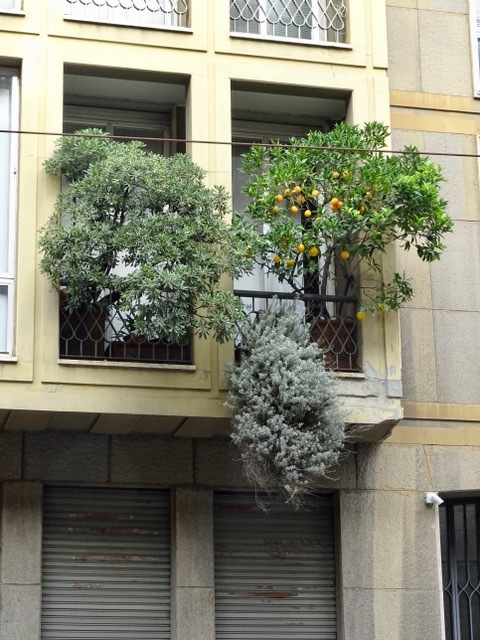 Walking towards the Bibliotheca Ambrosiana I spot this little balcony with an orange tree full of fruit. I’ve never seen that before. We pass a little church and I decide to peek in. We are really glad, because it is absolutely amazing. 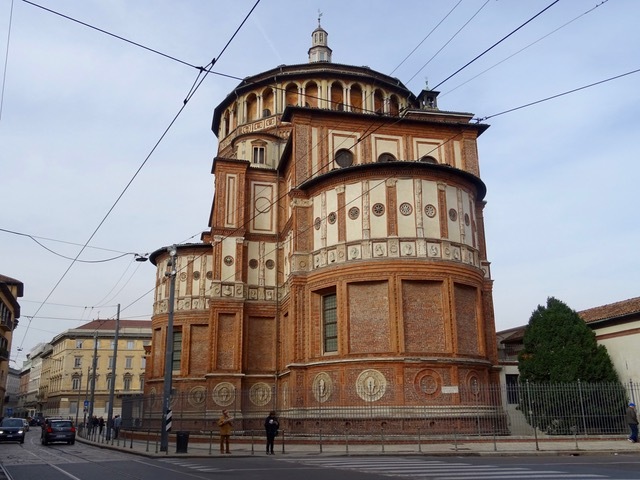 The Chiesa di San Maurizio was built in 1503. 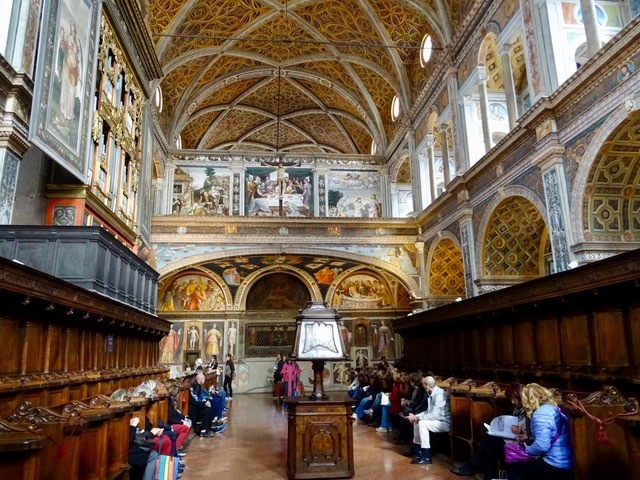 This room is used as a public church and we when we went through a little odd shaped door in the back left corner of this church… we find another church that was used as a cloistered church. I think it was called the Nun’s Hall. 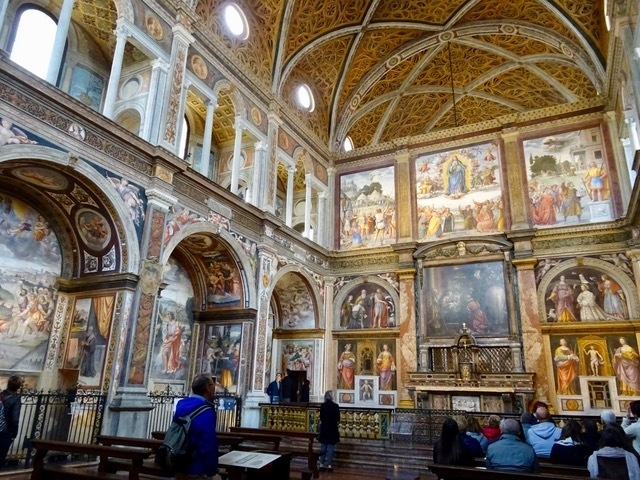 There are over 4,000 square metres of pictorial decoration in this church. If you look carefully you will see a painting of the Last Supper on the back wall. We had a little laugh about that. 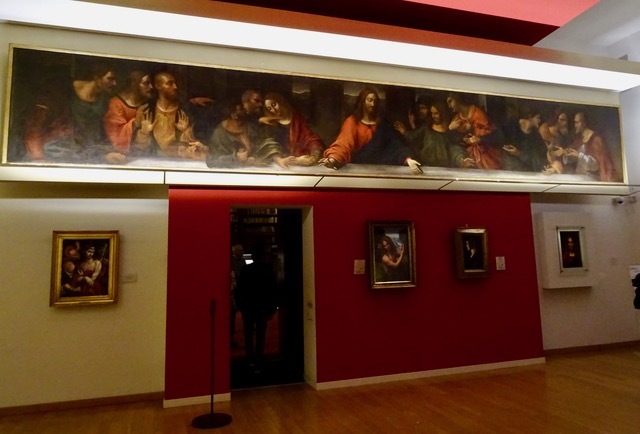 At least we get to see a painting of The Last Supper even if it is not Leonardo Da Vinci’s! 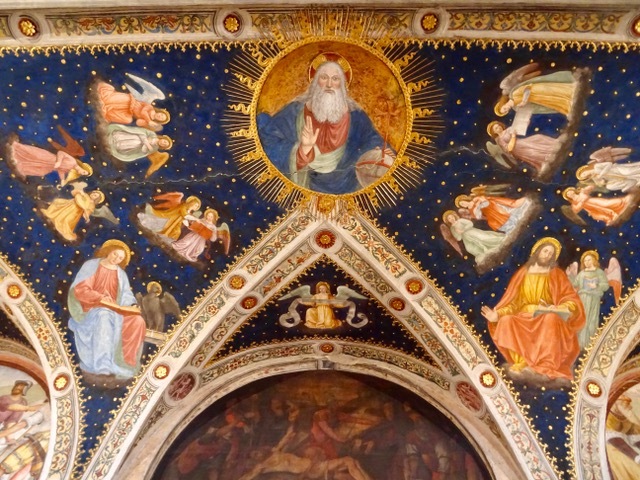 Here is a close up of the beautiful painting in the arched area of the above photo. It was stunning! The shops are closed today but we can still window shop a bit. 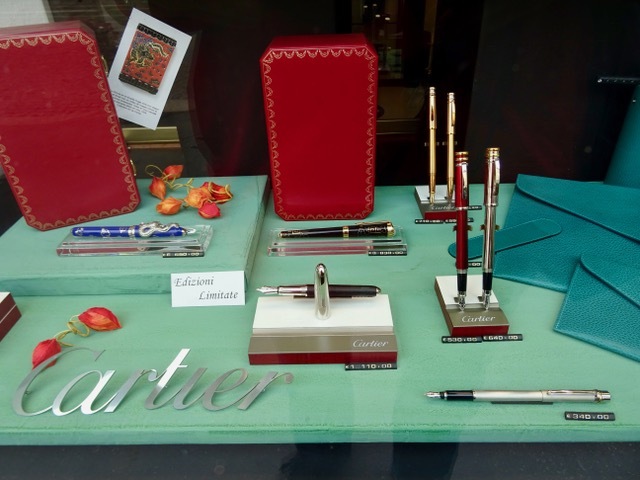 I have enjoyed experimenting with a few different fountain pens this trip, but I certainly can’t afford any of these. 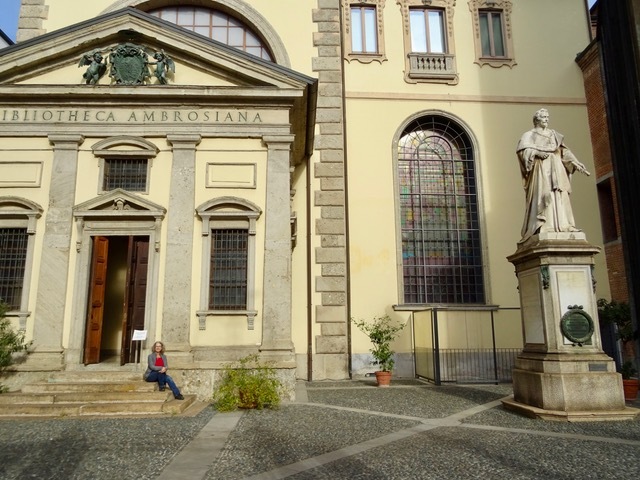 We arrive at the Bibliotheca Ambrosia only to see a sign saying we need to go to a different address to buy our tickets. I peek into the door and find someone who explains that the tickets are available at the front of this building, and that this is the exit. Of course there are no signs explaining this to us, or anyone else. This is actually a very nice art gallery, and not really a library at all. 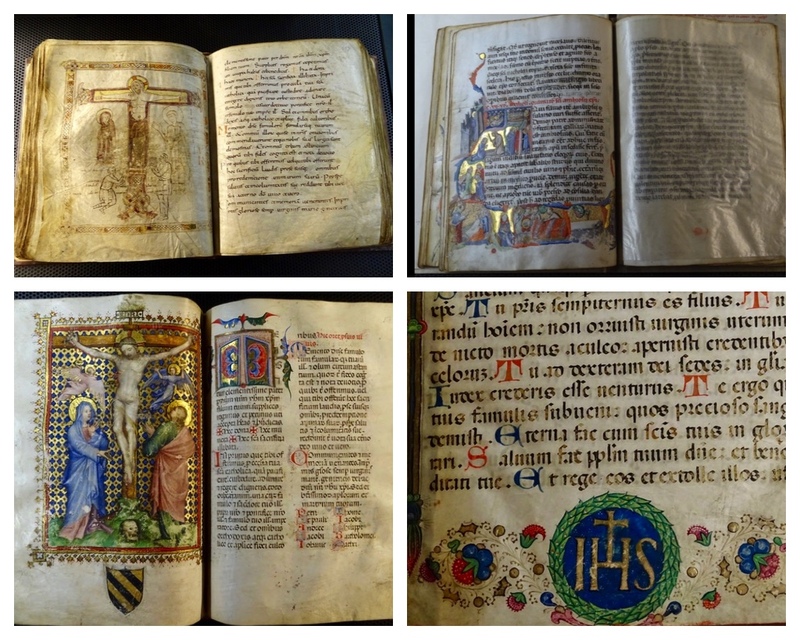 There are 26 rooms of beautiful paintings, sculptures and other objects including an exhibit of Ambrosian Liturgical Codices which is very interesting. The oldest one in the top left corner below is from the 9th century and is usually not on public display. 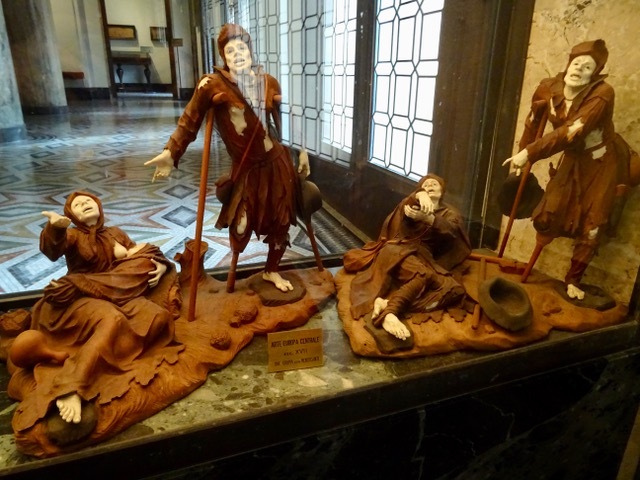 I quite liked this little group of sculptures from the 17th century. They’re about a foot tall. 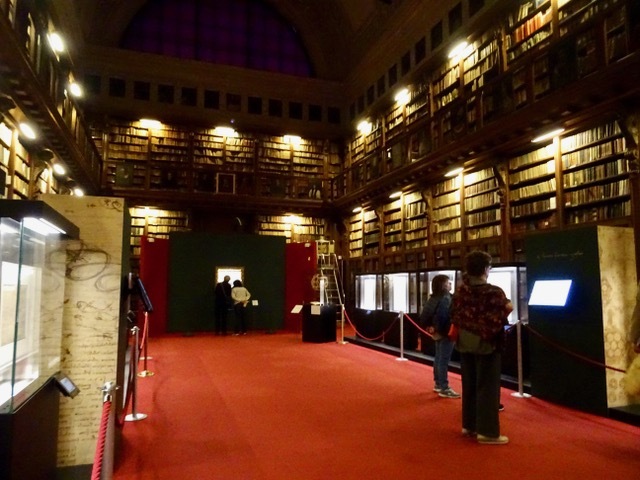 We get to see yet another Last Supper, and … finally we find a room that looks like a library. 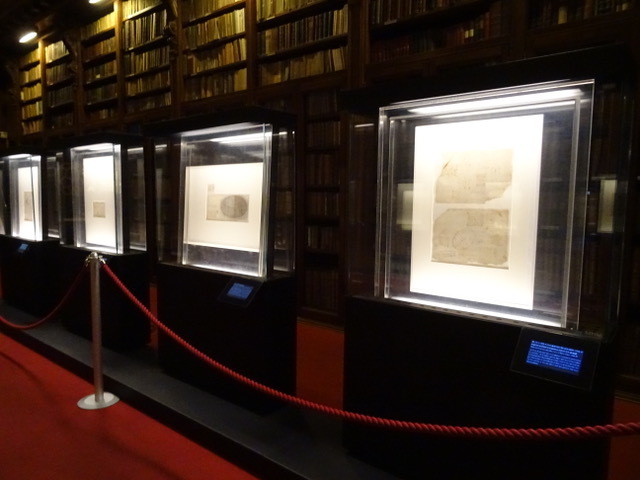 It contains the exhibit of Leonardo da Vinci’s sketchbook pages that we had come to see. There are 16 pages on exhibit. I am surprised at how small they are. 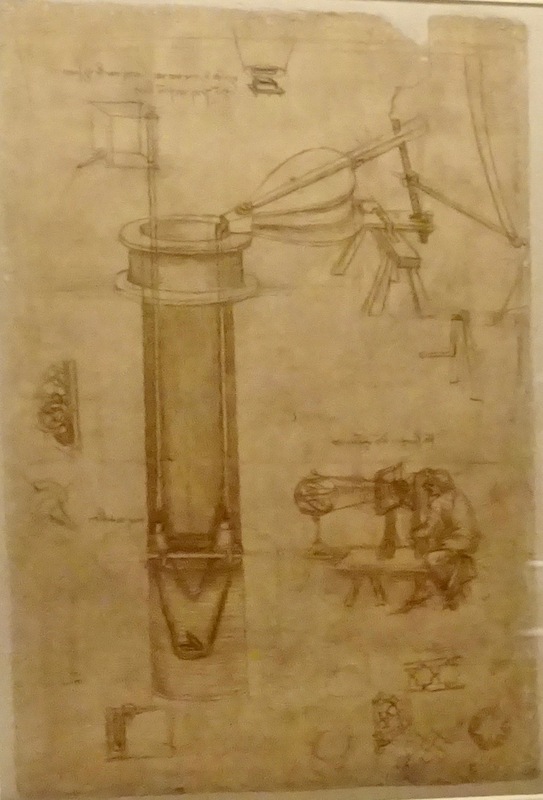 I have a book of Leonardo’s drawings at home and I always thought that the pages of his sketchbook were much larger. His writing is a special kind of shorthand that he invented himself. Da Vinci also mirrored his writing, starting at the right side of the page and moving to the left, so if you want to read it you must hold the page up to a mirror to reverse it. All too soon it is time to leave. 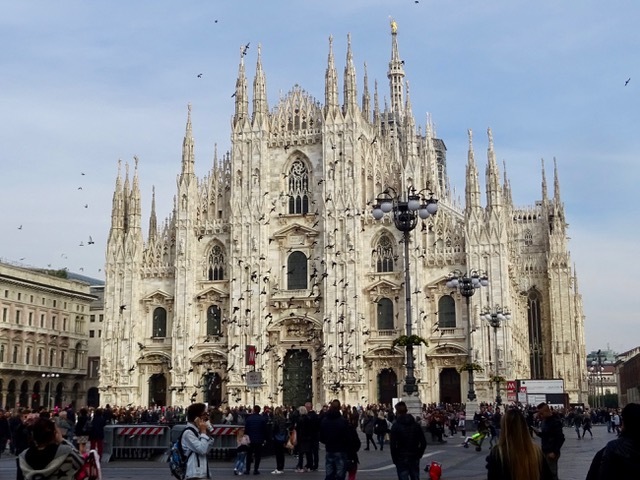 We walk past the Duomo one more time, just as all the pigeons decide to take flight. What a commotion! There were kids laughing and kids crying and adults ducking to get out of the pigeon’s way. 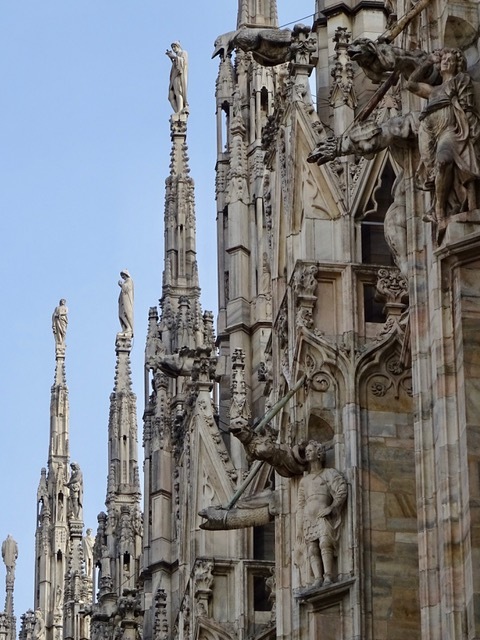 It reminded me of the movie ‘The Birds.’ I wanted to see the gargoyles on the Duomo. There is so much to look at on this building that I didn’t even notice them yesterday. There are lots of them high on the side of the church. 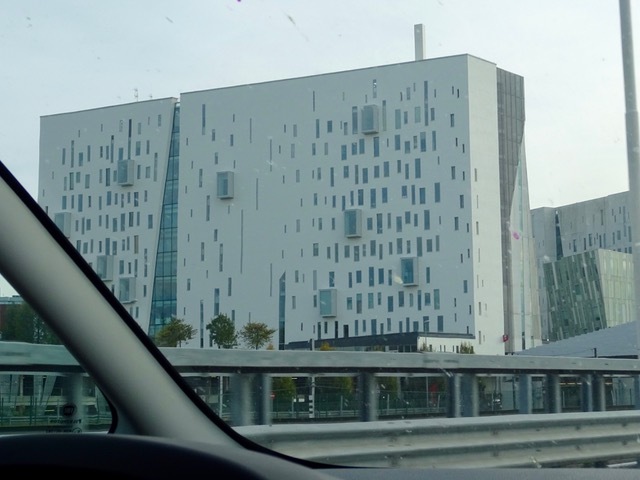 On our drive to La Spezia we pass some interesting buildings, including several of these oddly angled high rises with very strange windows. 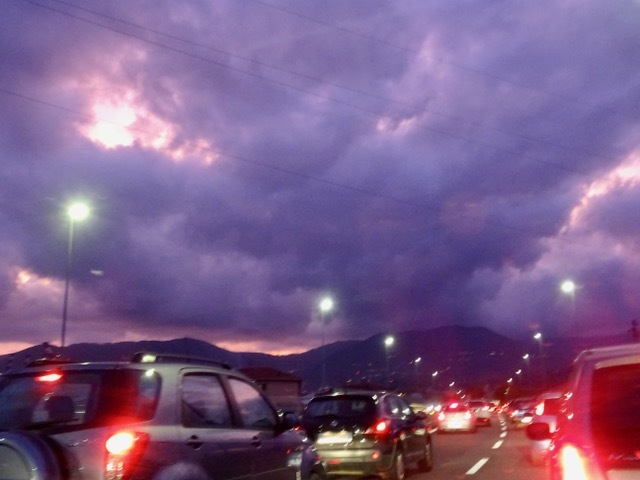 It was getting dark as we pulled into La Spezia and the very dark clouds were backlit with the setting sun. I have never seen a sky like this before, it was quite eerie. The colours in this photo are true to life, not enhanced at all. Our new Airbnb is very nice and I think we will be quite comfortable here for the next week.